The Fyunka Girl Is Coming to Bahrain! 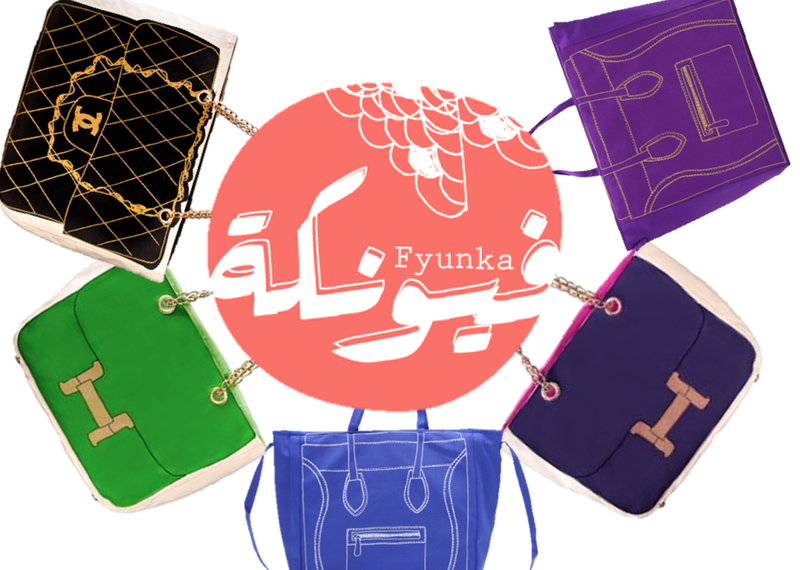 Fyunka is a fashion accessories line created by Jeddah-based designer Alaa Balkhy. Fyunka is an Arabic slang word and can be defined as a ribbon bow. Balkhy was inspired by pop culture and Middle Eastern insights, which she demonstrates in her designs. First launched in June 2011, Fyunka has become hugely popular because of its strong fashion focus and stylish illustrations that most women in the Middle East can relate to. Fyunka will participate at BAB Market, a contemporary outdoor festival at Bab Al Bahrain and Manama Souq on March 21, 22 and 23 from 4 pm to 10 pm each day. Balkhy will be selling her exclusive handbags, tote bags, cosmetic pouches, pillows, and more products. At BAB Market, Balkhy will showcase her latest pieces inspired by the Arabian veil or the burqa. The Fyunka brand is all about adding a pop of design into one’s wardrobe with quirky quotes, illustrations and a range of colors that brightens one’s day. Balkhy likes to illustrate designer bags, shoes, traditional Oud bottles, veils such as the burqa, and kohls and combines them with witty Arabic quotes when creating her pieces. Using both canvas and PVC, she creates bags that she believes would become an extension of young women, their character and their style. Fyunka stocks a limited quantity of her collections at boutiques in twelve cities, including Green Diamond in Bahrain. Obai & Hill is thrilled to represent and assist Fyunka at BAB Market. For more information about Fyunka’s stall at BAB Market contact sara@obaiandhill.com.